The U.S. Navy, Defense Advanced Research Projects Agency (DARPA), and Northrop Grumman X-47B Unmanned Combat Air System – Demonstration (UCAS-D) team chalked up another impressive achievement on Wednesday, July 10, 2013, with the first successful automated landing by an unmanned aircraft on an aircraft carrier at sea. At 13:39:50 EDT, the second X-47B prototype AV-2, callsign “Salty Dog 502,” conducted a perfect “trap” on arresting wire number 3 aboard the USS George H.W. Bush (CVN 77). AV-2 was then launched off of a forward catapult, conducting an additional trap onto the Number 2 wire. The UCAS prototype was then launched a third time, but an onboard subsystem failure caused the X-47B to automatically abort the landing while on final approach. AV-2 was then diverted to a landing at NASA’s Wallops Island facility in Virginia. The aircraft remains there at this time, being evaluated and awaiting repairs and clear weather to return to NAS Patuxent River, Md. Despite the abort of the third landing attempt, program officials consider these first automated carrier landings an unqualified success, and are exuberant at the results. Senior Navy officials, including Secretary of the Navy Ray Mabus and Chief of Naval Operations Adm. Jonathan Greenert were aboard the Bush to personally observe this milestone in naval aviation history. The Navy intends to restart the X-47B trials on Monday, July 15, subject to weather conditions, along with availability of one of the prototype air vehicles and the George H.W. Bush. 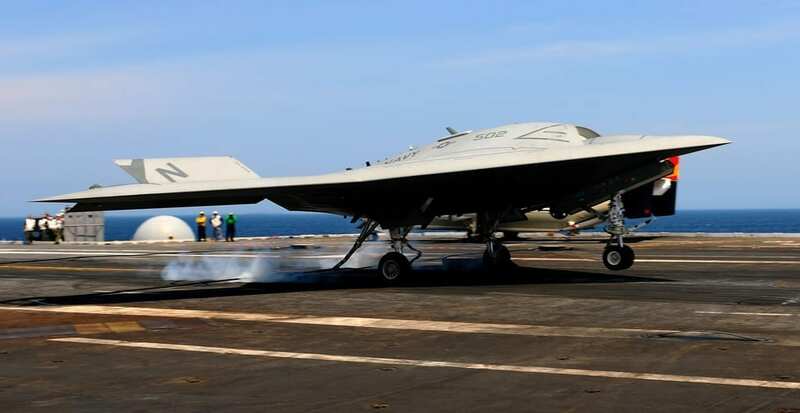 Current plans are to conduct additional landings and takeoffs from CVN 77, and then shut down the flying phase for the X-47Bs by the end of the year. The prototypes will then be put into storage, awaiting possible reactivation and use in future test programs. With the arrested landings of July 10, the UCAS-D program has delivered another success, and is expected to lead to the development of an operational UCAS within a decade.